Lisa is Busy Nerding: My first card challenge! You guys, I was SO EXCITED to finally cut my teeth on a card challenge! I started super duper easy with a Clean and Simple challenge (which is kinda my style anyway) and the theme was "love". I had thank you cards to make and a CAS challenge to attend to - the stars aligned and I was ready to fire up the Cricut Explore and get crackin! Click on through and I'll show you how I got there. Because I just CAN'T wait until the end of the post to share this with you! Isn't it simple and cute and fun? Like I said, I had thank you notes to send. You may know I was at ALA Midwinter (a librarian conference) and scored all sorts of free Advance Review Copies of incredible YA books to review and was so impressed with the generosity of all of the publishers and publicists. I thought thank you notes were in order, so here we are. Here's my materials! I have an embosser, I cut the pink overlay to size using the Cricut Explore (seriously, adjusting the size of materials is SO much easier on there than it is using a paper cutter), cut out the book elements and hearts using the Cricut Explore, and finally using the pre-made cards + envelopes made everything that much quicker and easier! I love that I can cut out things loads at a time and have since decided that I will always make several of the same cards at once so I can FINALLY get a stock of cards going. I ended up making 15 of these and mailing them all out, but next time! I mean it! For real! Adding texture to cards is the easiest thing in the world with one of these babies! 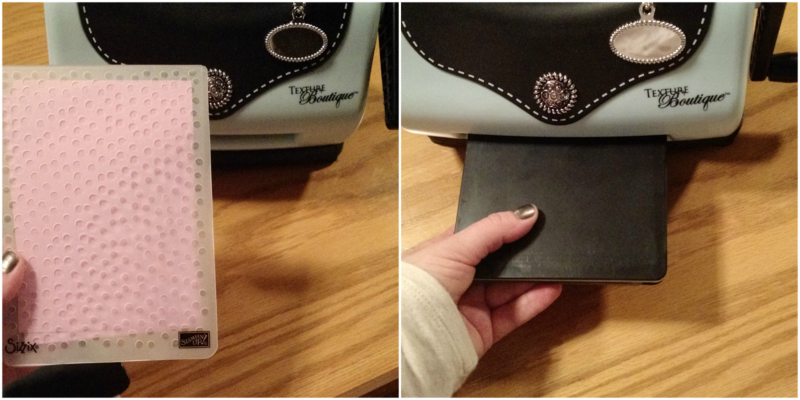 This is a hand me down Texture Boutique from my mother-in-law and that embossing folder is Decorative Dots from Stampin' Up. I love that it's an asymmetrical dot pattern and I use it pretty much always. When making multiple cards that are the same, I like to have my pieces organized and ready for the most efficient assembly. Yes, I have a touch of OCD and no, I do not plan to do anything about it. The next step of organization is to coordinate what adhesive I plan on using for the different elements. For sticking on large pieces, I like to use the old faithful Scotch double sided tape. I know it's a bit old school but I just love working with it. It's easy. It's cheap. It's effective. If it ain't broken, etc. The last stage of adhesive using the Zig glue pen. This is, hands down, my favorite adhesive tool. It is so easy to use and I've used it for months - MONTHS - and it hasn't dried out! It is inexpensive, versatile, and I'm basically ready to buy stock in the darn thing I'm so in love. 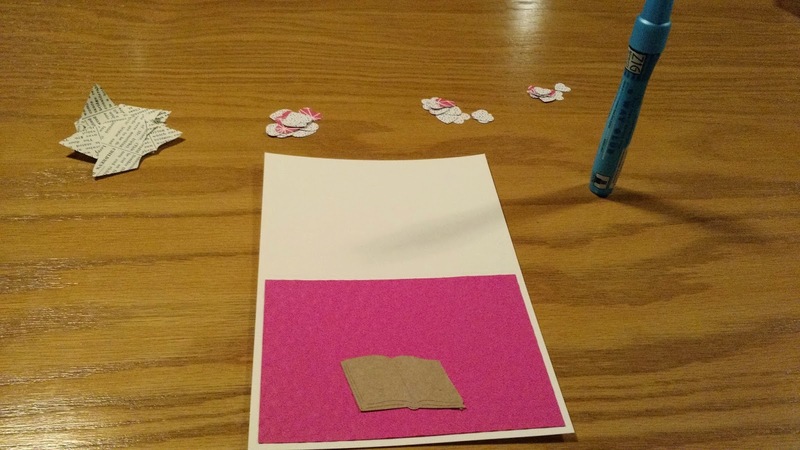 It worked perfectly sticking the hearts to the textured paper of the card! 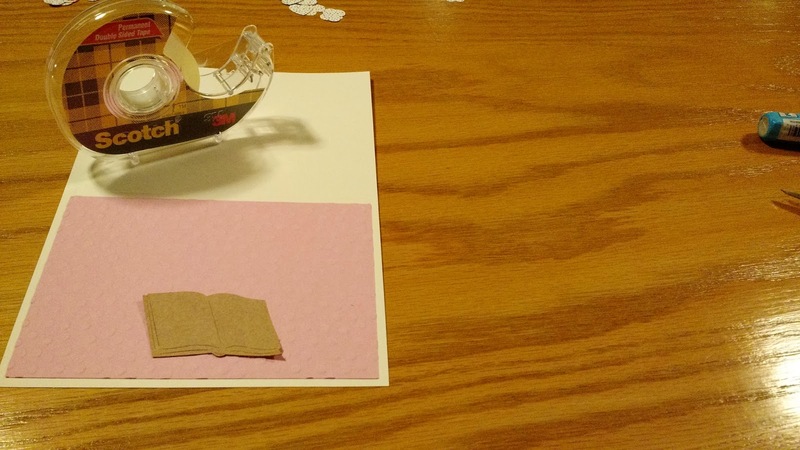 The final project, yet again! I agree, cute card! Your posts are fun to read! 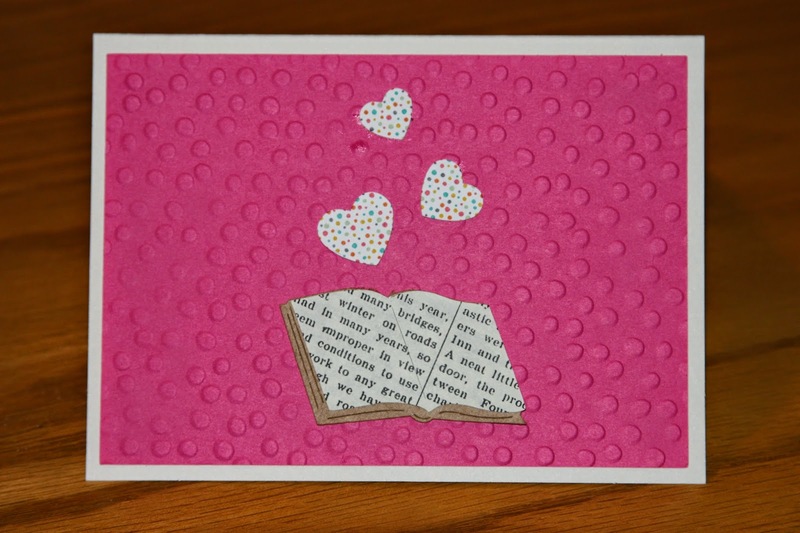 Love the texture used on your card and what a great idea of sending thank you notes to the publishers. Good Luck on the challenge. Thank you! I felt like a little something more was needed and texture seems to fill that void without being CRAZY, you know? Love the texture of the background embossing on your card. I love the hearts and the cool book you cut out. I do not have luck with glue pens, so will have to try a Zig pen! First challenge, wooohooo!! I think what hooked me on cardmaking last fall was my first challenge. 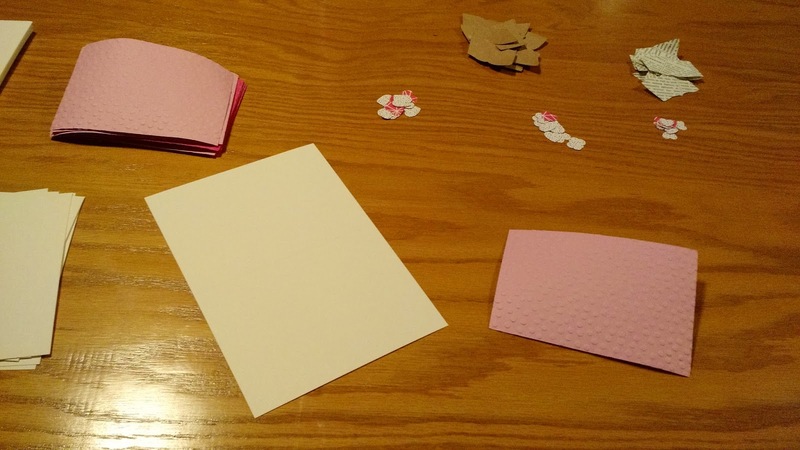 :) It felt like I was cardmaking with a purpose, lol. Aside from the Christmas cards I made, most of my cards are just going into a stash for who knows what, but I really like doing challenges to point my cardmaking in a direction.